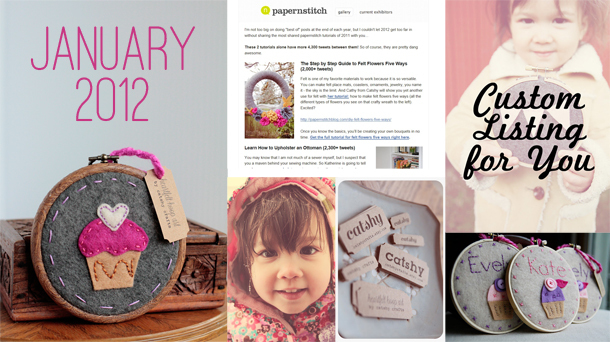 As I look forward to 2013 and blogging more in the new year, I'd love to also take a look back at 2012 and see what the Catshy Crafts blog brought to the crafting table (so to speak). 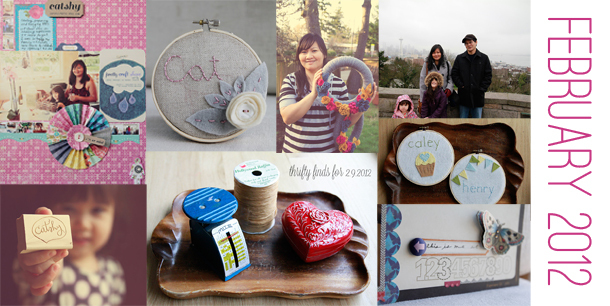 In January 2012, I designed new hoops for the shop including several Valentine's Day gifts, shared my process for custom orders, started to create my own kraft product tags for my items, played in the snow, got some fun news here and here and shared some scrapbook pages. 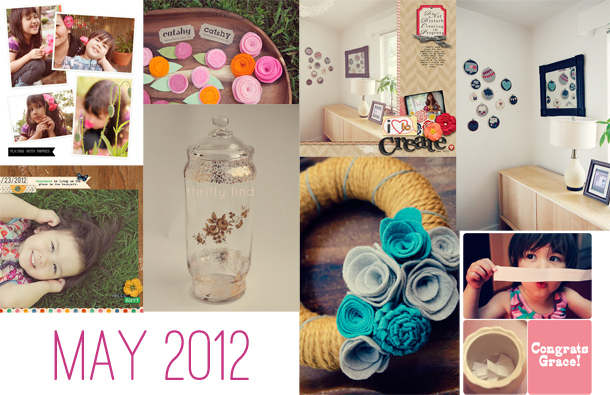 In February 2012, I scrapbooked. I designed a new personalized hoop that is now one of my most popular in the shop. I had a small press mention. I went thrifting. I created a set of hoops for a friend's four grandchildren. My brother came to visit. I ordered a custom rubber stamp. In March 2012, I continued to scrapbook with paper as well as with two new digital designers. I participated in a swap. I added more felt flowers to the shop. I added a new colorway to my oval personalized hoop which his now by far my biggest seller. I took photos of crazy weather in WA. And I made a couple of special hoops for a giveaway. In April 2012, I made some boy-friendly hoops. I made a wreath for my Dad. I enjoyed the beauty of my magnolia tree. I went thrifting at my own childhood home. I created the hoop that I now consider my signature piece (it's on all my business cards!). I shared some of my favorite blogs. I made some felt flowers for a giveaway. 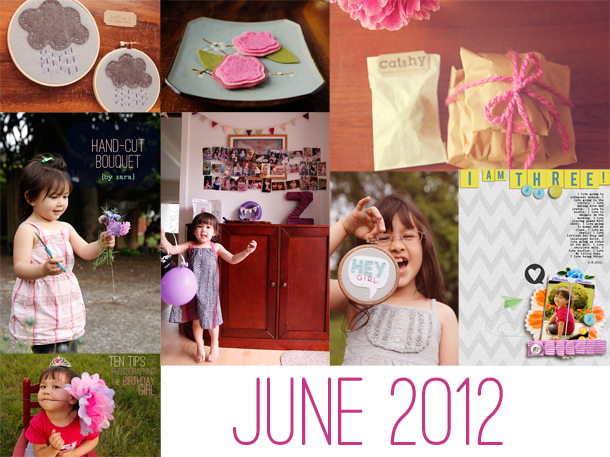 May 2012 was a particularly busy month for me blog-wise! I racked up 21 posts. 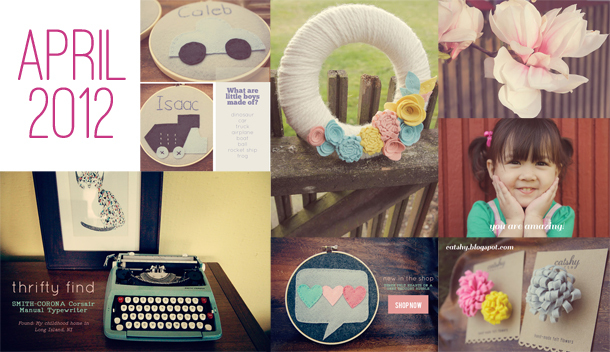 Some of the highlights: I created my first 8-inch wreath for the shop. I digi-scrapped. I visited a new thrift shop. I gave away a set of felt flowers. I made a home for my hoops in my living room. I had fun with my family on Memorial Day weekend. I created a new set of flowers for the shop. June 2012 proved to be another prolific month for me - with 15 blog posts. My youngest celebrated her third birthday. I offered tips on how to photograph the birthday girl. I made a new hoop or two. My garden was blooming. I posted about my packaging and shipping tips for my shop. I blogged about a re-launch of one of my favorite designers.